Coaching: The What, Why And How. Our thoughts. Feel free to share this information with your community. This is our first article in a What Is Coaching series. 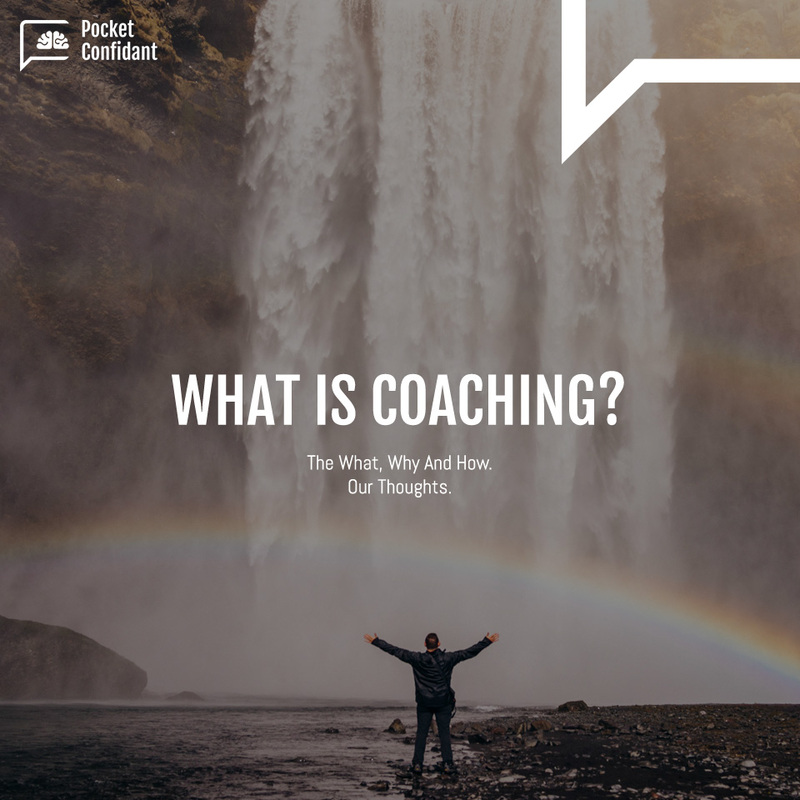 We are writing this in response to the many questions we receive when we tell people we are coaches and we are building a virtual coach with technology. The most frequent questions are “what kind of coach are you?” “what kind of coaching do you do?” or “in which domain do you coach?” Perspectives are based on what people see around them (sport coaching, executive coaching, nutrition coaching etc.) and frequently when asked for their definition of coaching the response is often that a coach provides advice, solutions, answers. However, this is not entirely true, as coaching is designed to help people build their own answers, from their own resources. 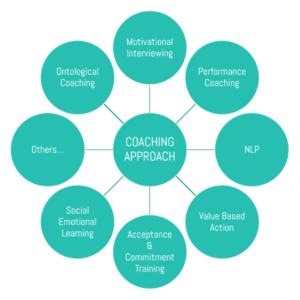 We would like to share our understanding of the term “coaching” based on our knowledge, experience, research and advisory board (see resources and references at the end of this article). At PocketConfidant AI we are passionate about coaching. Two of our founders are professional coaches, trained and certified through professional schools and programs, and the team is supported and supervised by an international advisory board in the domains of coaching, clinical psychology, HR, Education and IT. Our experts bring rich and diverse experience to our work. They have developed certified coaching programs, built coaching schools, created educational programs and curricula, trained professionals in executive roles, consulted in Health Care Systems, held leadership roles in large resilience building initiatives and coached thousands of people for multiple purposes (health, leadership, education). The term “coaching” encapsulates many approaches (see picture 1 below). All approaches help to move people through transitions. All work to identify blocks and limiting patterns. There are many similarities between approaches due to the fact that answers are found in the language of individuals (M. Erickson, G. Bateson, B. Russell, A. Korzybski, N. Chomsky). Coaching uses various communication techniques such as questioning, reformulating and reframing. Face to face coaching also takes advantage of being able to observe body language during coaching conversations. Coaching can be done face to face, on the phone, by chat and using various digital methods. Face to face coaching naturally improves the coach’s ability to receive more complete information due to the ease of observing a person while listening to what is said. When doing digital coaching it is not possible to have a full spectrum of information regarding the coachee (the person who is being coached), however, it remains possible to offer a good coaching experience for many different situations where the observation aspect can be put aside, for a little while. Coaching can be done in short non-traditional sessions and settings. It supports personal and professional growth based on self-initiated change (coming from the person who asks) in pursuit of specific actionable outcomes. Coaching, at its best, inspires new ways of thinking and new ways of approaching the challenges an individual may face. The effective coach is able to bring out the client’s unique strengths, skills and wisdom. Coaching creates accountability to make progress and fulfil goals. Coaching avoids advising or diagnosing. While problem-thinking focuses on what is wrong, outcome-thinking requires self-distancing and provides the platform to move towards something you want rather than away from something you wish to avoid. So, what does a coach do? Based on our studies and experiences, we define a coach as a person who has a “posture”, a professional attitude made up of listening skills, attentiveness and goodwill. To reuse the work of one of our advisors, a coach’s goal is to establish a relationship with the client (or coachee), based on mutual trust, confidentiality, true and honest information and feedback; a relationship in which, you as a client, will feel openness and comfort to share your personal story, thoughts or feelings. Coaching is unique, because a coach is here to help you achieve what you want and what you define. In this main goal of “building a relationship”, the coach should be dealing with the person “as a whole”. As a coach, you attempt to provide support, feedback, and new skills that will move people toward their goals. As part of this process, a coach asks good questions that stimulate conversation and thinking, and help an individual to see things from a different point of view. Finally, a coach can also make suggestions or requests, and the client has the right to say “no”. As a coachee, you are always in control of the process and remain an active participant. Key takeaway: coaching begins with an individual’s decision to reach an outcome; coaching uses different communication techniques to collect feedback from the coachee; coaching avoids advising or diagnosing. Contact us to share any thoughts, we welcome your reflection and engagement. Follow us on Facebook and Twitter to get the latest information. Alfred Korzybski, Polish-American scholar among the first to reveal language’s impact on people’s behaviors. Carl Rogers, PhD Psychology, initiator of « Humanist Psychology » with person-centered approach. Abraham Maslow, Psychologist, stressed the importance of focusing on the positive qualities in people. Virginia Satir, Family Therapist, brought in questioning methods, enabling people to go through transitions with adapted language. David Grove, New Zealand Psychotherapist, followed by James Lawley and Penny Tompkins developed « clean language » which promotes better clarity of communications, neutrality and objectivity, ease of understanding, and cooperative productive relationships. C.R Synder, Psychologist, Dr Martin Seligman, Barbara Fredrickson Positive Psychology. Paul Wastalwick (Palo Alto School founder) and Gregory Bateson, pioneers of change therapies demonstrating the need to find new-perspective-observation-points to create sustainable change in people’s behavior. Robert Dilts, has contributed one of the most efficient coaching systems having further developed the work of Bertrand Russell and Gregory Bateson on the « Logical Levels » of Human learning systems. Steven Hayes: Founder of ACT and known for an analysis of human language and cognition, and its application to various psychological difficulties. Norman Doidge: Psychiatrist, work on Neuroplasticity. Sir John Whitmore: the success of the GROW model in both problem-solving and goal setting, helping to maximize and maintain personal achievement, enjoyment and productivity. James O Prochaska: The TransTheoretical Model (TTM) of change in health psychology explains or predicts a person’s success or failure in achieving a proposed behavior change, such as developing different habits. It attempts to answer why the change “stuck” or alternatively why the change was not made. And of course, our advisory board. Founder @PocketConfidant AI, Certified Coach, Masters in Business, lived and worked in 5 countries. Passionate entrepreneur, focus on global issues with a will to contribute and improve our world. "Keep going".